We are the experts in System Verilog. Our expertise will help you in enabling seamless integration, easy usage and achieving optimal performance in verification planning, coverage and closure. Our platform is fully built on SV and it comes inbuilt with UVM\OVM methodology support. After deploying, our core team will work closely with you to customize the solution for your environment. We will ensure that you use our advanced features to maximize your productivity. Bundled with application specific tests and scenarios for corner cases. ABLE5, 5th gen Bluetooth5 VIP, is the latest addition to our BLE VIP portfolio. 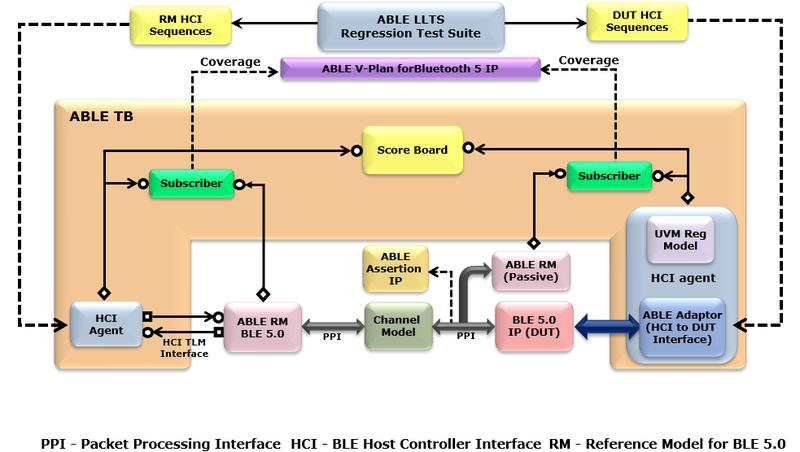 Our extensive research in the BLE verification space and close association with Bluetooth SIG over the last two and half years has helped us understand the nuances in verifying various implementations of existing and upcoming BLE IPs / SoC’s. With this understanding, we have built this intuitive VIP which is modular yet robust. Salient features of this refined architecture include HCI based test bench and TLM based golden reference model. This reusable infrastructure, packaged with a comprehensive set of test cases, will rapidly help you realize verification convergence and ensure LLTS compliance at the IP level / HCI TS compliance at the system level. ABLE3, 3rd gen BLE 4.2 VIP, is the latest addition to our BLE VIP portfolio. Our extensive research in the BLE verification space over the last two years has helped us understand the nuances in verifying various implementations of existing and upcoming BLE IPs / SoC's. With this understanding, we have built this intuitive VIP which is modular yet robust. Salient features of this refined architecture include HCI based test bench and TLM based golden reference model. The on board protocol analyser captures protocol sequences, displays it in an user friendly environment helping you to easily debug complex and highly interleaved traffic. You can further extend the built-in coverage to add your own coverage bins for any user specific sampling event or data. This reusable infrastructure, packaged with a comprehensive set of test cases, will rapidly help you realize verification convergence and ensure LLTS compliance at the IP level / HCI TS compliance at the system level. Please complete the following form then click 'continue >>' to complete the download. Note: By registering, you agree for us to store your contact information and to receive future communication from ACEIC.